Rebel Og will send 2 teams to Limerick for the Munster U16 competition. Below are the respective panels that are involved. The draw for the Munster U16 Football Tournament which takes place on July 7th took place recently. Cork Minor Footballers will open their 2018 Munster championship on Wednesday 11th of April. Cork’s opening game will be a meeting with Waterford in Páirc Uí Rinn with a 7pm start. Two other Q-Final clashes will take place on Wednesday night when Tipperary will play Kerry and Clare meet Limerick. Cork will play Waterford in the Electric Ireland Munster GAA Football Minor Championship Quarter-Final on Wednesday April 11th at 7pm in Pairc Ui Rinn. Cork Minor Hurling team came so close to winning the All-Ireland title today against Galway, but fell at the final hurdle and lost by just two points. All involved in Rebel Og would like to thank all involved in the squad and to all the clubs who got behind our minors who made a big impression in the 2017 champipnship. Winning the Munster Minor title only a few weeks ago was a great achievement for Cork on a day in which we did the double. The appetiser before the main meal was seriously tasty as Galway edged out Cork in today’s Electric Ireland All-Ireland Minor Hurling Final. The young Tribesmen came into the game as underdogs but they hurled their hearts out to record a brilliant victory. Cork had a big billing after an impressive run to the Final and their undoubted class was plain for all to see, but Galway matched them for pure skill. But in the final reckoning it was pure hard graft that probably won them this match, because the doggedness of their tackling, hooking, and blocking was of the very highest calibre. They showed impressive mental strength too because they shipped some heavy blows in the first half but their resolve never wavered. Cork scored their first goal of the match straight from the throw-in as Brian Turnbull hit a ground-stroke to the back of the net after just six seconds. And when his fellow corner-forward Evan Sheehan cracked home a brilliant second goal from a tight angle to put Cork 2-3 to 0-3 ahead after 13 minutes, it looked like the game would go like most predicted it would. But Galway hadn’t read that script. They dug in, defended with great tenacity, and began slowing the quantity and quality of ball making its way into Turnbull and Sheehan. At the other end of the field the strapping Sean Bleahene was starting to make his presence felt and a couple of points from him and some sure free-taking from Conor Molloy had reduced the gap to just three points at the break – 2-7 to 0-10 in Cork’s favour. Galway’s star man Jack Canning had been well marshalled in the first-half by Cork captain Sean O’Leary Hayes, but he exploded into life in the second-half and provided Galway with the impetus to win the game. He bore more than a passing resemblance to his uncle Joe when he smashed home two brilliant goals to the roof of the Cork net in the first ten minutes of the second-half to turn the contest on its head. The confidence seemed to drain from the young Cork hurlers, and they struggled to find an adequate response in the face of some brilliantly aggressive Galway defending. Canning and Bleahane were now bullying the Cork full-back line and two more points from the deadly duo pushed Galway 2-16 to 2-11 ahead. Credit to Cork, they came with a late charge that ensured the game went right down to the wire. Two points from the brilliant Turnbull sandwiched one from Robert Downey to reduce the gap to two points with five minutes to go. Craig Hanafin had a half-chance to score a goal for Cork after a powerful run and smart pass from classy centre-forward Liam O’Shea, but he couldn’t get his shot off and was then suffocated by the scrambling Galway defence. Try as they might Cork just couldn’t make any more inroads into Galway’s lead, and that was thanks largely to some truly inspirational blocking and tackling by Jeffrey Lynskey’s young charges. When the final whistle blew Croke Park erupted as the Galway supporters hailed the perfect start to their afternoon. It wasn’t Cork’s day, but many of their players clearly have very bright futures despite this result. Scorers for Galway: Jack Canning 2-2, Conor Molloy 0-7 (7f), Sean Bleahene 0-5, Ben Moran 0-1, Donal Mannion 0-1, Daniel Loftus 0-1. Scorers for Cork: Brian Turnbull 1-7 (3f), Evan Sheehan 1-0, Liam O’Shea 0-3, Craig Hanafin 0-2, Robert Downey 0-1, Daire Connery 0-1, Barry Murphy 0-1. GALWAY: Darach Fahy; Caimin Killeen, Daniel Loftus, Darren Morrissey; Ronan Gleenon, Conor Caulfield, Mark Gill; Conor Walsh Conor Fahy; Ben Moran, Conor Molloy, Martin McManus; Sean Bleahene, Donal Mannion, Jack Canning.Subs: Shane Ryan for Martin McManus (ht), Sam McArdle for Daniel Loftus (54), Mark Kennedy for Ben Moran (56), Enda Fahy for Conor Walsh (60). 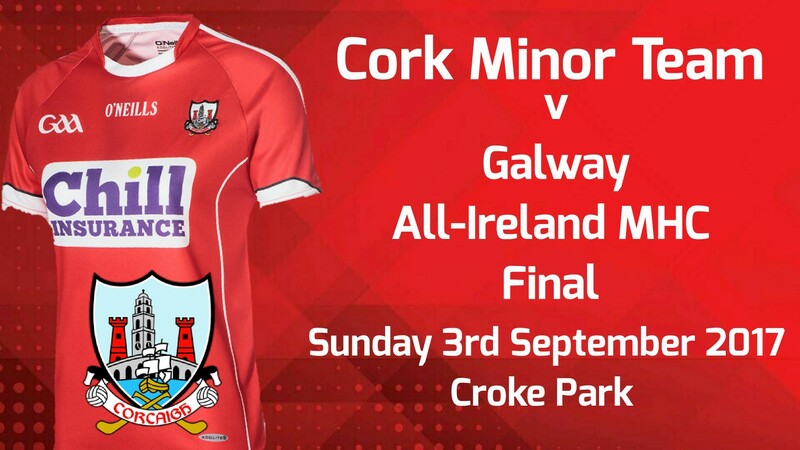 The Cork Minor Hurling team to play Galway in the All-Ireland Minor Hurling Championship Final next Sunday 3rd September in Croke Park @ 1.15pm has been announced as follows. Significant hope has been attached to this current Cork crop throughout the year. Two epic matches against reigning All Ireland champions Tipperary underlined the class and character that exists Leeside. Cork are developing talented teams in the underage ranks with the future appearing bright. Jeffrey Lynskey’s Galway finished strongly to defeat Kilkenny at the penultimate stage for a noteworthy win. Ultimately it means that this Sunday’s decider promises to be an extremely interesting encounter. Dublin were rugged during a tight Semi-Final tussle against Cork as Brian Turnbull registered 13 points. Midfielder Daire Connery is another highly promising Cork youngster and Galway will need to restrict his influence. Brian Roche and Connery have forged a solid midfield partnership for an in form Cork outfit, but Galway have proven to be resilient so far. Galway’s powerful full forward line includes Sean Bleahane, Conor Molloy, and Jack Canning, who combined to score 1-8 in the Kilkenny success. Donal Mannion and Enda Fahy made important impacts from the bench in that game too as Galway advanced to the decider. How Cork cope with Galway’s attacking unit will be another key factor in this tie. Two innovative managers, Denis Ring and Lynskey, are keen to produce talented hurlers and they are carrying that task out impressively. Since 1992 Galway have gleaned nine All Ireland minor titles confirming the diligent work that is being carried out in the underage ranks. Cork’s last minor success occurred in 2001, but their recent All Ireland Under 17 triumph offers serious encouragement. Having defeated Waterford, Tipperary, and Clare in Munster, Cork eventually overcame Dublin’s spirited challenge. Galway were efficient when outfoxing Clare and Kilkenny, but they will be fully aware of Cork’s pedigree and potential. GIVEN it’s his fourth year involved, selector Liam Martin would be forgiven for feeling pretty satisfied heading into this Sunday’s All-Ireland final. Of course they want to win and complete the perfect season, but seeing as Cork haven’t even reached the minor decider since 2007, the campaign has already been a success. Denis Ring and his selectors have given it everything to restore Cork’s fortunes at minor. All the credit should be shared according to the northsider. “The county board, Rebel Óg, particularly, and all the people who are doing savage work in clubs everywhere deserve this. The minor team is only the end of a player’s underage career. That was certainly the case in the drawn Munster semi in Thurles. Fellow Glen club man Robert Downey saved Cork at the end of normal time and then Na Piarsaigh’s Evan Sheehan goaled a free at the death in extra time against Tipp. That set up a replay at Páirc Uí Rinn and a Munster final against Clare, where this young Cork team ripped it up. Ger Collins, Sean O’Leary Hayes, Brian Turnbull, Evan Sheehan and Daire Connery among the many stars. Martin acknowledges how much they fed off the hurling buzz in Leeside this summer. He explains that it’s especially enjoyable to be involved with this minor crop given their eagerness to learn and develop. Everywhere you go in Cork, from Blackpool to Bandon and beyond, kids are out in force with hurleys again. Martin must take particular pride in seeing city hurlers, from Piarsaigh, Douglas and Glen, backboning this minor team. “Personally I don’t care where they come from as long as they’re good enough. “That’s where the Development Squads system have paid off. Would have got a corner-back from Dromtarriffe otherwise in Conor O’Callaghan? He’s been excellent. “Of course you need the city to be thriving for Cork hurling to be successful – but it’s a big county and the gospel has spread all over Cork at this stage. He makes the point that once the various sectors are co-ordinated, good hurlers will come through. Can they seal the deal this Sunday, especially after a patchy enough showing in the semi against Dublin? “Galway have won five minor All-Irelands and been beaten in four finals since we’ve won it in 2001. It’ll be tough. Simple as that. Hopefully that will be enough. 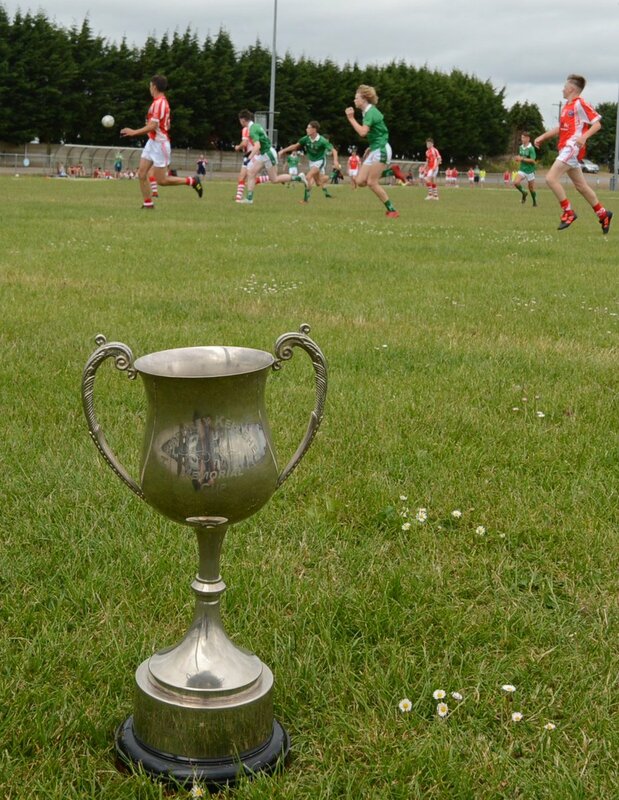 Cork squads take part in Inter-County tournaments. Great success for our @RebelOg_ teams again. Wins at U14B U15 A & B and U16 B unlucky to lose out in U14A Well done to all working so hard. Sonny Walsh Final (FT) @OfficialCorkGAA 2-11 @GAAClare 1-6 #GAA @OfficialCorkGAA @RebelOg_ #Corksquads Congrats to all involved! Cork u15 Bs win opening game inClarecastle. U14s lose their opening game of Tony Forristal to Galway by a goal. Cork beat Limerick in opening game in Munster U15 Group 1 game. Cork win opening game in Waterford as Cork U14 B team with a win over Dublin. Best of luck to Cork Squads this weekend. Below are some of the good wishes that we have got to @rebelog twitter page. Rebel Og / Cork U16 ‘A’ Team that will compete in this weekends All-Ireland U16 Tournament 2017. This weekend, Rebel Og will send out U15 B hurlers to Clarecastle for the Munster U15 B championship. Below is their jeresy number and club detail. All you need to know about the Rebel Og / Cork U14 Tony Forristal Team that will play in Waterford this weekend. The fixtures and group information for U16 All-Ireland Tournament details have been made available. All you need to know about the games is below. Rebel Og Squads that will take place in the All-Ireland U16 hurling championship on Saturday. Rebel Og / Cork U15 Hurling Squad that will take place in this weekends tournament in both Cork and in Clare. On Sunday afternoon, Rebel Og Academy squad days were in action across the county. The U15 footballers held their first official session in the new Paric Ui Chaoimh following its reopening. Rebel Og would like to thank all involved in the facilitating the session. At this months Cork County meeting, the All-Ireland U17 trophy was in attendance following Cork’s super win over Dublin in this year’s decider. The Cup was formally presented to the board.